MSNBC has long relied on a roster of opinion-heavy shows with a liberal bent to carve out its place in the cable news world. But having struggled to keep pace with its competitors, the network has made moves suggesting that it is turning more to straight news in an effort to rebound. Last week, MSNBC canceled two of its daytime opinion shows: “Ronan Farrow Daily” and “The Reid Report.” The move follows network president Phil Griffin’s end-of-2014 memo, which said that in 2015 “investing in original reporting” would be the channel’s focus. This turn to reporting – and away from opinion – would be a significant change for the network. A 2012 Pew Research Center analysis found that MSNBC’s programming was 85% commentary/opinion and 15% factual reporting. By contrast, both CNN and Fox News Channel had a relatively even balance: 46% opinion vs. 54% reporting for CNN, and 55% opinion vs. 45% reporting for Fox News. MSNBC’s strategy had also relied on positioning itself as a liberal alternative to Fox News. In 2008 and 2012, Pew Research found that MSNBC was more negative about Republican candidates than Fox News Channel was about Democratic candidates. MSNBC’s coverage of John McCain and Mitt Romney was 73% and 71% negative, respectively. 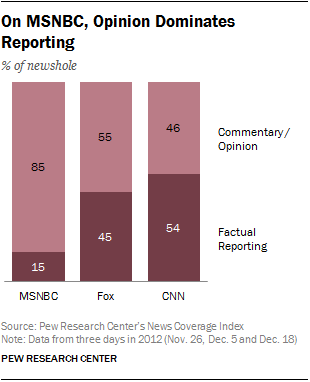 In contrast, Fox News’ campaign coverage of Barack Obama was never more than 46% negative. MSNBC’s apparent repositioning comes at a difficult time for the network. Its overall ratings are strong: MSNBC’s median prime-time audience for 2014 (567,500) is higher than CNN’s (494,500), though both are down more than 8% from 2013 – and down even more from 2008. But MSNBC’s total revenue for the year (over $400 million as of October) lags significantly behind CNN’s (about $1.1 billion as of October), in part because MSNBC’s prime-time shows draw fewer viewers than CNN’s in the 25-54 age demographic. Both networks trail considerably behind Fox News’ 2014 numbers for viewers (1.7 million median prime-time viewers) and revenue (nearly $2 billion as of October). These changes come as the 2016 election is getting into full swing. Given that cable news is Americans’ top regular source for campaign news, election season is a particularly important time for MSNBC. A strong performance in the 2008 election made the network competitive with CNN: MSNBC’s median prime-time audience rose 61% from 2007 to 2009, compared with 21% for CNN, and 2010 was the first year MSNBC’s prime-time audience topped CNN’s.